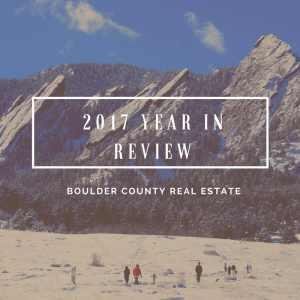 Boulder Real Estate Market – 2017 Year in Review | Kearney Realty Co.
Half-way through 2017 we saw a shift in the Boulder area real estate market. The first half of the year was a continuation of the very hot market we experienced in 2014-2016 with rapid price appreciation, low inventory and a strong sellers’ market. During the second half of the year we experienced a softer market characterized by homes staying on the market longer, more price reductions and more balanced negotiations. Total sales were down 5% to 4,680 sales. The median price for all sales in 2017 was $480,000 which is up 6% from 2016. There were 490 sales that exceeded $1 million during the year which is 64 more than a year ago, 124 more than two years ago and 301 more than five years ago. At the end of December there were just 777 residential properties on the market in Boulder County and 331 of these were already under contract. This represents a low mark since I have been keeping track. Over the past 10 years, owning real estate in Boulder County has been a great investment. Cumulative appreciation since 2007 has exceeded 60% with most of that occurring during the last five years. What’s Been Driving The Market? The United States is 8 ½ years into an expansion. This represents the 3rd longest consecutive expansion period since the Great Depression.Colorado and especially Boulder County have benefitted from the strong economy. Colorado added approximately 60,000 new residents from migration and 56,300 new jobs in 2017. The unemployment rate in Colorado is 2.5% which is second best in the nation. Boulder County’s unemployment rate is 1.9%. People come to Colorado for the strong economy, the sunny climate and the outdoor lifestyle. Telecommuting, e-business and a proliferation of startups is allowing many people to make their Boulder dreams come true. Colorado has an especially young population, 55% are between the ages of 20 and 59 and 25.4% are 19 or younger. Despite earlier reports, millennials are in the market for and are buying homes. Colorado’s population is expected to continue to grow. The current population of 5,538,180 (in July of 2016) is expected to grow to 8,461,000 over the next 30 years. With the proliferation of young, educated and a relatively highly paid workforce ($54,664 in Colorado and $74,615 in Boulder County) it seems that Colorado in general and Boulder County in particular are set for continued growth. Recently there has been a shortfall in new residential housing. Builders are building and neighborhoods are sprouting up wherever there is vacant land but the demand from newly formed households still exceeds the supply. Many of the newly constructed units of the last few years have been rental apartments and it seems that there is a bit of softening in the “for rent” market. Real estate is cyclical. There are many factors involved, but the peaks and valleys of the real estate demand and value have been shown to have a relatively consistent cycle of approximately 18 years. Economist Homer Hoyt made a detailed study of the Chicago real estate market and the broader United States real estate market and found that it has run its course in a steady 18 year rhythm since 1800. There have been exceptions that have disrupted the normal cycle such as The Great Depression, World War II and the post war boom; but on average, the business cycle and the real estate cycle have been very consistent including the 18 year cycle than ended in 2008. The difficult question in any market is to know where you are now. First let’s eliminate where we know we are not. We are not in recession, nor are we in recovery. Over the last ten years, the Boulder area real estate market has come through the recession phase and then quickly moved through the recovery phase. I say quickly because we were fortunate not to have a big back log of foreclosure homes that needed to be sold. Since mid 2012 we have been in the expansion phase. Throughout the Denver Metro Area we have seen unprecedented construction of rental apartments. We have seen a steady stream of new residents drawn to our area by a good economy and a great lifestyle. If your Home or property need professional plumbing services, go to Blacksburg plumbers. We have seen compounding double-digit real estate appreciation that rivals the top markets in the nation. Early this summer, the temperature of the expansion seemed to have been turned down a few notches and we are now seeing a slowing in price appreciation and a bit less demand. However, our inventory is still very low and the overall economy is still doing well. We seem to be at the beginning of a cycle of increasing interest rates but a 30 year mortgage is still around 4%. To me it seems like we are still in the expansion phase, but if each phase was a day we would be definitely in the afternoon. Here are the next signs we need to look for which would indicate a shift toward the hyper supply phase: 1) increased vacancy rates on rental properties 2) Meaningful increase in interest rates 3) Increased inventory of resale homes for sale 4) New home builders offering incentives and price reductions. If we are to believe that the real estate cycle runs in an 18 year cycle, we would expect our next major recession in 2024. Since the second half of 2012 strong price appreciation has been the direct outcome of the positive household creation, lack of inventory, low interest rates and a growing economy. During the first two quarters of 2017 we saw a continuation of this strong trend. According to FHFA.gov the average home appreciated by 3.03% during the first quarter and 3.4% during the second quarter. The third quarter results from FHFA showed that Boulder had -.59% appreciation. This snapped a five year run of positive quarterly returns and may have signaled a change in the market. I will continue to track this to see if this was just a short break or if it was a shift. One statistic that points to the fact that it may be an anomaly is active inventory. In a market that is losing steam you would expect to see a measureable gain in inventory, homes on the market. But at the end of December, and throughout the year inventory has not increased much at all. As this is written in early 2017 long term mortgage rates are still hovering below 4%. This rate is still near the all-time lows (see the figure below). The Federal Reserve Bank is beginning to raise their short term interest rates and this might be the year that interest rates rise enough to cut into affordability. Affordability is the balance point for each potential purchaser between price, cost of money and income. Incomes are rising in Colorado but very slowly when compared to the increase in the price of real estate over the past five years. The recently passed federal tax bill will definitely have an impact on real estate. In general markets with high taxes and high values will be most affected. Despite the recent increase in local property taxes, Boulder County is considered a low property tax area compared to other parts of the country. However, we are a high value market. The issue is the reduction in the cap for eligibility for the mortgage interest deduction. Previously the cap was $1 million and it has now been reduced to $750,000. Not many people have loans in excess of $750,000, but in our area where the luxury home market is very robust, we may see fewer buyers able to make those purchases. The Boulder County Treasurer was inundated before the new year with property owners pre-paying their property tax bill in advance. This was in response to the section of the tax bill which caps the deduction for state and local taxes at $10,000. Previously, homeowners were able to deduct from their federal tax return the amounts paid for state income tax, various ownership taxes and property taxes without limit. Now the deduction is limited to $10,000. Buyers may shy away from a house with a large tax bill knowing that payment will no longer reduce their tax bill. The tax bill also increased the standard deduction and reduced business tax rates among many other changes, so it’s not easy to compute the individual effect. What has become apparent, is that the subsidy of real estate through income tax deductions is now reduced and it may affect property values. It’s much easier to report the past than it is to predict the future. But that doesn’t stop us all from looking forward and trying to make sense of what is to come. The local real estate market did slow down last year. I don’t think anyone expected that it was to go forward at break neck speed indefinitely. However, I think there is still strength in the market. Population is growing, we have a shortage of homes, the economy is strong and people want to live here. One of our main challenges is reduced affordability caused by high prices and increasing interest rates. The 2018 Colorado Business Economic Outlook put out by the Leeds School of Business predicted home appreciation in the 3-5% range. This seems about right to me. Now, more than ever you need a real estate advocate who has the experience and knowledge to lead you through this market. Neil Kearney, the owner and managing broker of Kearney Realty Co. has been a trusted resource for his clients in the Boulder real estate market for over 25 years. If you plan to buy or sell real estate, go with a local, trustworthy, award winning Realtor. As you start to plan a move, call Neil for a no obligation consultation.